Huguenot resident James Fundaro attempts to break the world record for most successful three-point basketball shots in one hour at I.S.75 while raising money for the Rachel Cooper Foundation, which provides heart surgery for children in need. The record for most three-point shots in an hour was achieved in 2008 at 835. 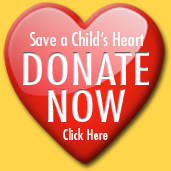 The Rachel Cooper Foundation for Pediatric Cardiology celebrates this year’s Valentines Day by sponsoring their 775th “Heal-A-Heart” life saving surgery at The Children’s Hospital at Montefiore (CHAM). 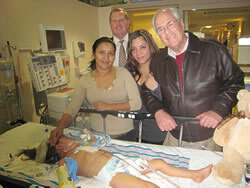 Four year old Ashli Elizabeth Amador Rodas was suffering from a life threatening congenital heart defect. She and her mother, Fany, traveled from Honduras to the Bronx, NY with the help and support of our partners from the Rotary “Gift of Life” program. Her heart defect was corrected this week and she is resting comfortable, regaining her strength and anxious to be able to play like any other healthy four year old. "Comforting our Rachel Cooper Foundation’s Heal-A-Heart child, Ashli Elizabeth Amador Rodas from Honduras are (L to R) Fany Amador Rodas (Ashli’s mother), Ray Hough (Rotary Gift of Life 7490), Giselle (host family) and Alan Fierstein (Vice President of the Rachel Cooper Foundation)"
NEW YORK - Four Iraqi children with life-threatening heart defects left a Bronx hospital Tuesday after successfully undergoing open heart surgery. Through its Operation Iraqi Hearts, Montefiore Medical Center has performed such operations on more than 500 children around the world in the past 15 years. "When you look into a heart, it's not a Muslim heart, it's not a Jewish heart. We are all the same," Dr. Samuel Weinstein, a pediatric heart surgeon, said earlier this month after the Muslim children - three boys and a girl, ages 6 to 14 - arrived.